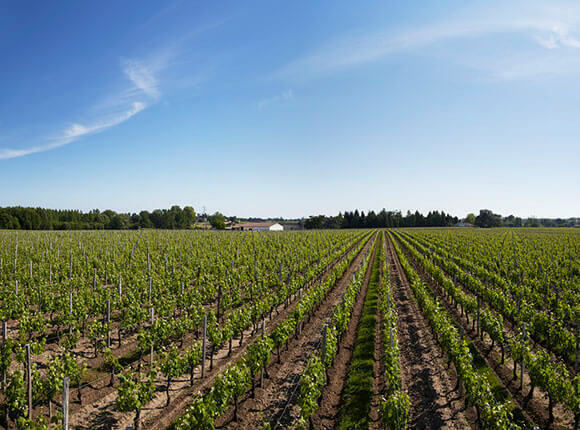 Château Moulinet nestles in its private, peaceful ocean of green, hardly 2 kilometres (11/4 miles) from the middle of Pomerol village, giving visitors a palpable feeling of well-being. An intimate relationship between the vines and Man, which implies infinite respect for the soil, carries on the rich wine growing tradition that inhabits this estate. The vines grow in an exceptional terroir of 18 hectares (44 1/2 acres) in one single plot. The vines grow on a remarkable single 18-hectare (45-acre) plot with a gravelly clay subsoil and varied top soils made up of pebbles, gravel and ancient sand, which combine to form a very rich terroir. Operations carried out on the vine during its growth cycle, such as leaf removal and thinning out lead to the smooth elegance characteristic of a great wine. Integrated cultivation techniques are employed, involving soil tillage and the use of environmentally friendly pesticides.